Every year, dozens of curious people climb up the Toaca peak to see how the mountain shadows merge into a virtual pyramid. The phenomenon, unique in Romania, has a scientific explanation, but it is surrounded by an aura of mystery. Beyond the magnificence of the landscape, designed to simply cut off the viewer’s breath, Ceahlaul entered and remained in history because of the mysteries that surround him. Far from equalizing other peaks in the country, the massif can still be seen, in clear days and under certain sunlight conditions, on the Black Sea shore, nearly 500 kilometers away, or on the shore as far away of the Dniester. In the hours of the East, above Ceahlau there are unique and inexplicable games of light. Older people considered the mountain to be the shelter of the Zamolxis God, and today’s people say the mountain is crossed by the Earth’s most powerful energy axis. Shelter of the gods compared to Mount Athos, by the ancient Greek geographer, Strabon, narrated in his writings about the holy mountain Kogaion, where the great priest Zamolxis lived, who later became the supreme god of the Dacians living in those lands. The legend says that Dochia, Decebal’s daughter, chose the same Ceahlau of Zamolxis as a place of refuge from the Romans. Enraged by Emperor Trajan’s hostility, she prayed for divinity and turned into a stone stand. The rock of Dochia still protects the massif today. There are two unexplained optical phenomena every year on Ceahlău. 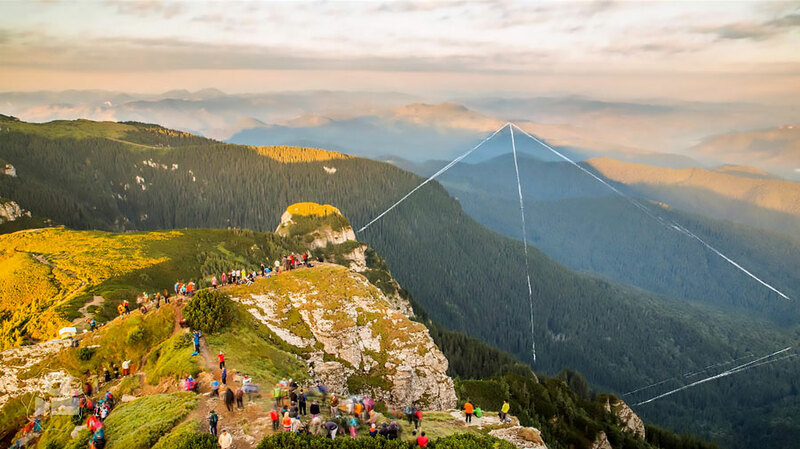 In the first decade of August, under the light of the sunrise, the shadows of Toaca and Piatra Ciobanului form for over an hour and a half, an immense natural hologram in the shape of a perfect pyramid. 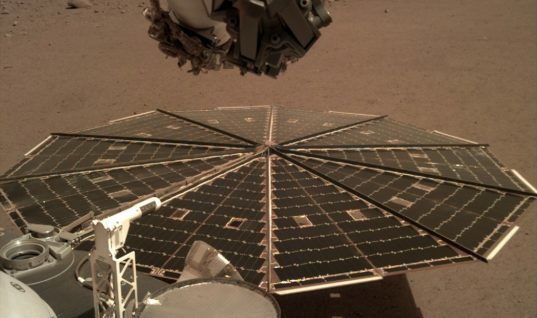 For this reason, the phenomenon was called the Shadow of the Pyramid. 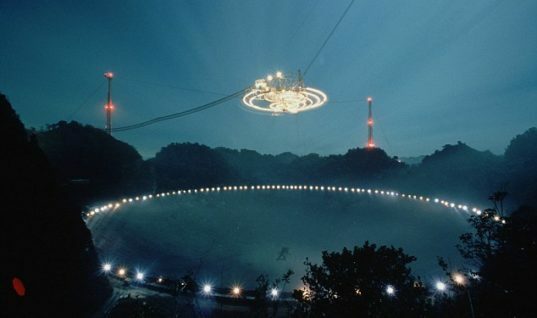 Also in the same period of the year and at the rising sun, above the Toaca peak, there is an optical phenomenon that lasts only a few minutes and which the locals have long since called the Heavenly Way. Practically, a pillar of intense and strange luminosity is formed above the mountain, lost in the immense sky, and bordered on the sides of two dark bands. 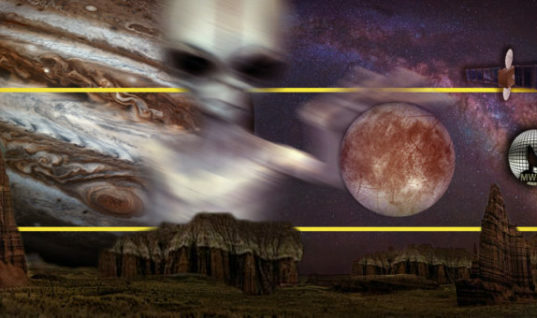 Some scholars of these phenomena think that this is due to the fact that through Ceahlau and Toaca peak one of the energetic axes of the earth passes. Those who want to see this miracle of nature directly have to meet two conditions: to wake up early in the morning (or to overnight on the mountain) and to be on the Toaca peak (1,904 m) before sunrise. Another condition, the whim of nature that often plays, is that the horizon line to the east is not blurred by the ceiling of clouds at the time the sun is on its way. Mihai Marin, passionate about photography and the phenomenon of the Ceahlaul pyramid, has studied and immortalized for nearly 15 years what’s going on for about 80 minutes on the morning of August 6th. “It’s a set of at least four shadows. The Toaca Peak has a regular pyramid shape with a square base and, under the action of the sun’s rays from the east, has a shallow triangle-shaped shadow. The Stone of the Shepherd, being smaller and lower, makes another prolonged shade. Likewise, Stone of Vulcan and Panaghia. Everything overlaps the light that passes through the mountain’s saddle. On August 6, in the morning, due to the position of the sun, all the shadows unite at the top and create a magnificent three-dimensional image as the hologram of a pyramid, “says Mihai Marin. In other words, the perfect superposition of the shadow peak only happens when the sun rises from a certain position. Mihai Marin argues that he was prompted to study the phenomenon on Ceahlău by another passionate man of the mountain, the geology professor Nicolae Ţicleanu from the Bucharest Institute. 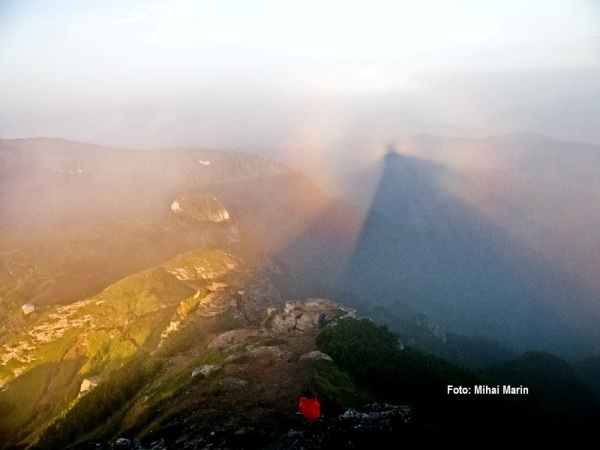 After hearing this optical phenomenon, Mihai Marin climbed very often to Ceahlău to study and understand him. He recognizes that, at first, the Ceahlau pyramid had an aura of mystery, even mystical. 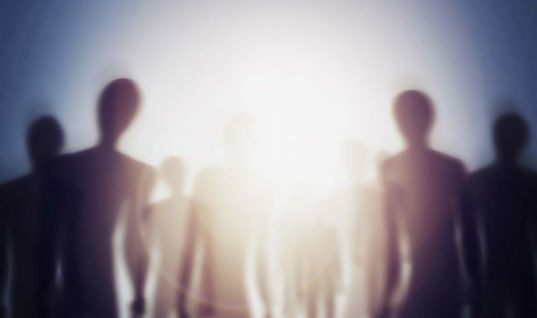 The study clarified that it is an optical phenomenon in which many shadows are perfectly arranged, but there are still a few unanswered questions. 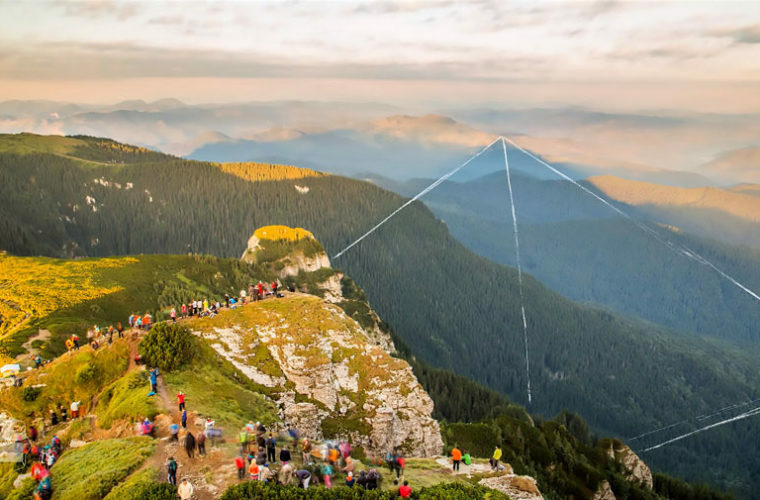 “Geometry of the mountain and the optical are very precise, each rock has its role in this geometric scheme and you wonder if there is no connection between the Dacian sanctuary recognized on Ceahlău and this natural phenomenon. Beyond the physical phenomenon itself, it is interesting that on August 6th, year after year, the villagers at the foot of the massif, even those of old age, take Ceahlaul in order to be present at the Lord’s Transfiguration Service at the high rise hermitage. 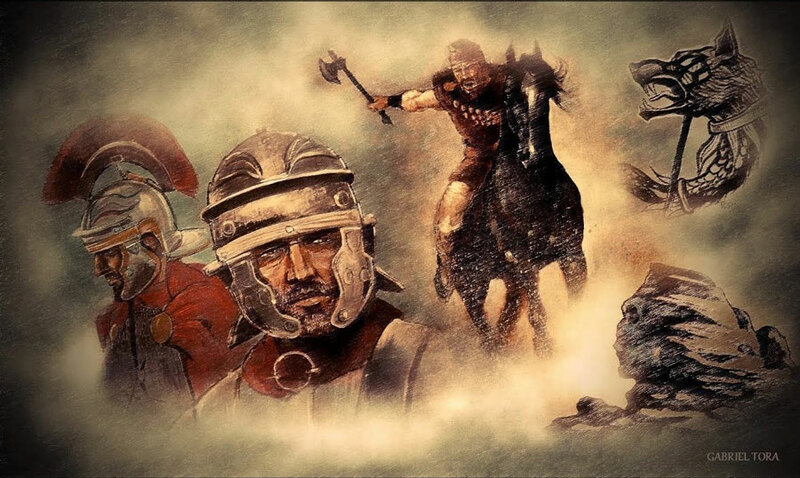 Pilgrimage seems to be even more distant from Christian times, known to be the custom of free Dacians who lived through these parts to please the mountain. “Ceahlau Mountain is full of sacredness by the fact that, over time, people have associated it with the Moldavian Olympics, but also with the pre-Christian history. It was said that Zamolxe, the god of the Dacians, would have lived on this mountain, “says Constantin Andras, head of the Ceahlau National Park guard service. Even more interesting is that only Ceahlaul and Mount Gaina, in the country, have a recognized celebration of the mountain, celebrated by the population worshiping it once a year. “Ceahlaul became sacred because, with the advent of Christianity, there have been established different Shiites who founded the hermitages and churches on the mountain. Instead of gaining spiritual powers, people continued to climb to the top of the mountain, the only one in Romania, similar to the Athos of Greece, “Constantin Andras said. A legend says that those who meet on Mount Ceahlau remain connected in one way or another forever. 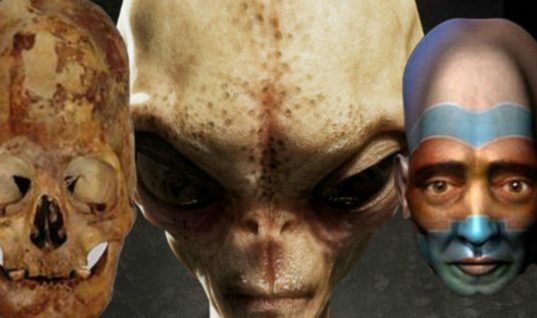 Could 2019 be the year we finally make contact with aliens? 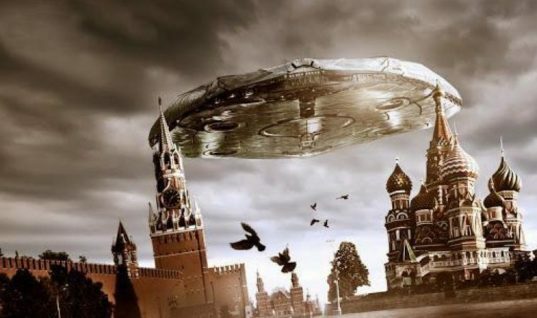 Russia Made An Announcement: UFO’s Are Real!